Just ‘LIKE & SHARE’ from plainQUIRKY’s Facebook page! There are a few things in life that make me smile from ear to ear and these products (along with far too many others) make that list. For that reason, I thought I’d have a little give away, to thank my readers for, well reading plainQUIRKY! 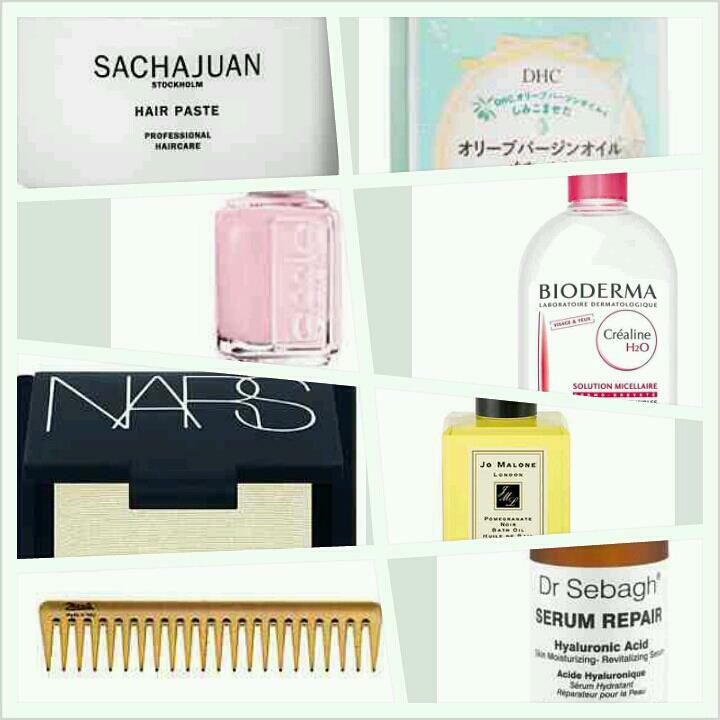 These products are some of my ‘go to’ beauty must haves. With what seems like millions of beauty brands offering the latest in skincare innovation and the unlocked secret to frizz free locks, its hard to know what to trust. Through admitted trial and error, I can whole heartedly recommend that these little gems will take pride of place in your beauty regime! Firstly is the Sachajuan hair paste. I tried this brand last year when I was sent a few products to review. I’m normally a hair oil and set with spray kind of girl but when I saw sleek, straight hair paraded down the runway of Felder Felder’s SS13 show, I knew I needed a product with a bit more hold. Step in Sachajuan’s hair paste and it made recreating this look effortless with guaranteed staying power. Japanese beauty products have been enjoying a new wave of popularity over here in Europe and the US, especially with brands such as Tsubaki and Shu Uemura becoming household names. Something that can be guaranteed with Asian products is the high quality and the brilliance of their formulas. With Japanese mascaras being the current beauty favourite on every beauty lovers lips, DHC virgin olive oil cotton swabs are a beauty kit must have for removing accidental smudges. DHC virgin olive oil isn’t anything new, with women all over the world loving the product for its lightweight and ‘skin saviour’ moisturising properties. For this reason, I love using these swabs to clean up an mistakes around the eye area, with added confidence that I won’t be doing my skin any harm! I got these at the beautyMART HQ on Millie Kendall’s recommendation, so you can be confident in the fact that they are brilliant! Next are a couple of cult beauty favourites. Highlighter is a must have to recreate this seasons must have ‘dewy’ complexion, especially if you favour a more matte finish foundation. With this being said, there are so many products out there promising the perfect glow in their highlighting products however, I’ve not found one with the right pigmentation and natural glow until I tried NARS ‘albatross’. Seriously, if this is the only new product you buy this season for your cheeks, you won’t regret it. This product is sheer enough to be worn alone and is essential to my makeup kit! On the trail of cult beauty favourites, Essie’s nail polish in ‘Fiji’ is an opaque pink with barely any warmth so is therefore perfect for the SS13 pastel revival. Essie is a polish brand that guarantees high quality and this colour will be my ‘go to’ hue this summer! Finally, Janeke is an Italian hair brand which specialises in high quality products. If you take pride in your hair, you deserve one of these! Used backstage at London Fashion Week, these gold combs are a must have. I never brush my hair when wet as this encourages split ends and breakages, so I always gently comb it through and these are a must have! Jo Malones bath oil in her signature scent ‘Pomegranate Noir’ is a product my skin can’t live without, for its moisturing properties aswell as it heavenly scent! Roberto Cavalli AW13 Milan Fashion Week. It’s often lauded as the make up remover of choice for models and make up artists….. The French have always championed world-renowned skin care, with brands such as Chanel and Nuxe showcasing skin care products that are industry front-runners. 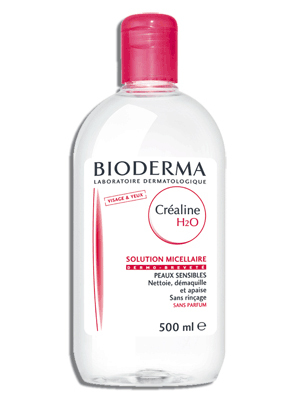 Hailed as being a simple cleansing water, Bioderma Crealine H20 Micellar Water has all the ingredients to be your next favourite beauty product. Found in many a make up artist’s kit, this cleansing water has super powers when it comes to removing make up. It’s heavy-duty against removing the last trace of products whilst being soothing and nourishing for the skin. Delicate enough for dry skin and perfect for skin susceptible to the dreaded acne breakout. It’s the magic beauty elixir we have the French to thank for. Seriously, gone are the days when you would hope & pray you had removed every last inch of make up from your skin, with Bioderma’s Crealine H20 Micellar Water you will never have to worry again. It’s not cheap, however it is without a doubt worth the investment. If it’s the only cleanser you buy this year, you certainly won’t live to regret it! Gearing up for Fashion Week is always an exciting time of year. New drones of Fashionistas, new trends and most importantly a whole new batch of style inspiration. I’m constantly inspired. Inspiration hits me on a daily basis through mediums such as Instagram and Twitter and with Fashion Week Fever being ever-present, my desire for a new look has prevailed. Nineties Cool is a trend I’ll drag kicking and screaming into SS13. Think acid hues with a fluorescent personality and you’ll be on the money. Think alternative, think new wave, think ‘I’m going out wearing neon plastic today’…… With this in mind and with inspiration hitting me from every angle, I’ve decided to dust of my sewing skills and create oversized grunge inspired pieces all of my own. What better way to channel your fashion creativity than through wearing something you’ve created? Channel your inner Henry Holland or Dries Van Noten SS13 or even Gwen Stefani complete with Minnie Mouse hair buns. You’ll be sure to be shamelessly on trend.